J ohn Muir's early experiences in Yosemite Valley gave rise to the Sierra Club. Built in 1904, the Yosemite Conservation Heritage Center is a Sierra Club library and education program that has inspired a deep abiding conservation ethic and love for wilderness adventure and preservation for generations of visitors. You can visit the Sierra Club's oldest public outreach and education program in Yosemite National Park in person during the summer, and online year-round. John Muir (1838-1914) was America's most famous and influential naturalist and conservationist, and founder of the Sierra Club. 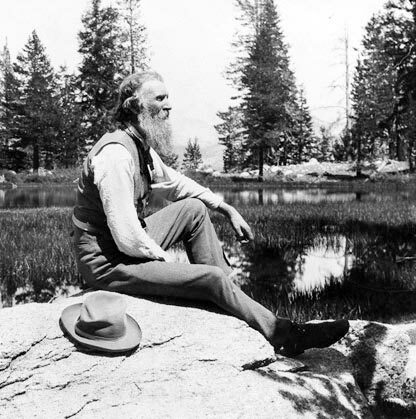 This website, known as the "John Muir Exhibit" features his life and contributions. Browse the links below for all things Muir. For the most recent features of this website, see the What's New section. See also what we and other Muir enthusiasts are sharing on the John Muir Fans Facebook Group. Spread the word: get involved! Take the Sierra Club Quiz to find out just how similar to our beloved Sierra Club founder, the Father of National Parks you are.